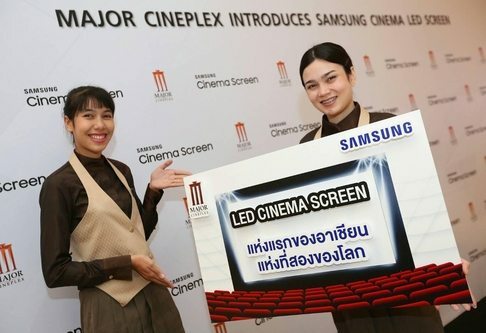 Thailand’s Major Cineplex has become the first international customer to place an order for Samsung Cinema LED (trademarked as Samsung Premier) direct video (DV) screen. The screen will be installed in Bangkok’s Siam Paragon Cineplex in February 2018. Samsung also confirmed that the next screen in South Korea will be installed in Lotte Cinema Centum City Pavilion in Busan in late September. Samsung has announced that it will supply cinema customers in USA, Europe and Asia with its 10.3 meter LED-based screen that offers 4K resolution, high dynamic range (HDR) and ten times the brightness of projection-based systems. Major Cineplex is Thailand and South East Asia’s largest cinema operator with 110 cinemas and 668 screens. It was one of the first cinemas operators outside of Korea to install CJ CGV’s 4DX screen and is know for its high end cinemas. As previously reported in Celluloid Junkie, the second installation in Korea will be the Lotte Cinema Centum City Hall in Busan. Known as ‘Super S’, rather than the recently trademarked ‘Samsung Premier’, it has been selected as an official screening hall of the 22nd Busan ? ?International Film Festival, which will be held from December 12 to 21. A total of 26 official films will be screened there, though it is not clear if any of these are specifically mastered for HDR and high brightness. The first ‘Super S’ Samsung installation has recently been playing regular DCPs of films such as “A Taxi Driver”. The fact that the Major Cineplex installation will not take place until February next year means that other international customers might have to wait even longer, or that Samsung will unveil one or two non-commercial demonstration installations in Los Angeles and/or London before the end of the year.